10 Mar Are you Knotty Or Not? Most of us start of thinking that ties are horrible and that they’re just uncomfortable but as you know, it’s an accepted manner of dress in today’s business environment. Whether you purchase your tie at Harry Rosen or at Goodwill, you want them to last and that means you have to take care of them, that’s where we come in. 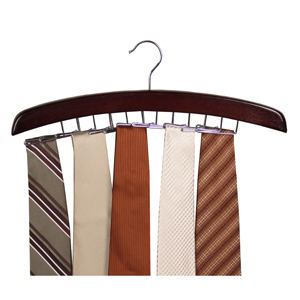 Another manner of storing your ties are to curl them up like belts. I’ve seem them coiled up and placed on their sides or folded over a few times and gently placed in small square cubicles in a drawer. These are both acceptable practices and again, this all depends on how much space you have and how much space you want to devote to storing them. All I know is that if you hang them up vertically, I find that sooner or later the wrinkles from normal wear gradually work themselves out. If the wrinkles on your tie persist, consider steaming them. Never iron your ties since they are generally made from silk or another delicate fabric and if you decide to take them to your cleaners, don’t have them pressed since that compresses the fabric and ruins the edge.